Starting in 1970, John Curtis played in the major leagues for 15 years. He was a respectable left-handed pitcher — 89 wins and 97 losses, with a lifetime ERA of 3.96 — praised as much for his eloquence as his fastball. John Duffield Curtis II was born March 9, 1948 in Newton, Massachusetts, the second son of George and Anne (Tafel) Curtis. Although he was too young to remember, he spent the first three years of his life at 165 Concord Street, Newton Lower Falls, in a house with a back yard alongside the meandering curve of the Charles River. His father was a reservations manager for American Airlines and was transferred from Boston’s Logan Airport to LaGuardia Airport in New York City. After mastering those first lessons, his father took Bill and John to nearby Gabler Field in Great Neck, and started working on hitting and catching fly balls. The brothers then took their early baseball education to the streets and joined in the neighborhood games of stickball and stoop ball, Wiffle ball, and anything else that would accommodate a bat and ball. John Curtis’ first introduction to organized baseball games came to him by way of Great Neck’s Police Athletic League before he reached age 10. At the age of 8, Curtis was also inspired after watching one of baseball’s greatest players. In 1957, the Curtis family moved to Smithtown, New York, also on Long Island but further out, in Suffolk County. His solid foundation in baseball, which had begun with his father, continued in organized youth baseball. He joined the local Little League team, graduated to the Babe Ruth League, and finally to the Connie Mack league at the same time he was on the junior and senior high school teams. Curtis, 6-foot-1 and listed at 175 pounds, became the first-round Red Sox pick in the 1968 draft. The left-hander was assigned to Winston-Salem of the Carolina League, where he pitched creditably but not spectacularly. That concerned Boston enough to keep him in Single-A ball in 1969. He was transferred to Greenville of the Western Carolinas League, where he improved and developed an impressive fastball. But there were still concerns. He walked 97 batters and his ERA grew to nearly 4.50, losing 12 of 18 decisions. His time in the minors also increased, but at least he was getting closer to Boston when he was moved to Double-A Pawtucket in 1970. He improved his control, repaired his ERA, and made enough progress that the Red Sox called him up in mid-August 1970 and put him in the bullpen. In the seventh inning, with the bases loaded, Curtis served up a pitch to left-handed Royals catcher Ed Kirkpatrick that was sent to Fenway oblivion, a grand slam that surprised the batter as well when he realized that Curtis was making his major league debut. “I didn’t know if the ball was going to make it over the Red Sox bullpen with the wind blowing in,” said Kirkpatrick.7 Asked if he would like to have the grand slam ball as a permanent memento, Kirkpatrick flashed a smile and held up a ball. “This is the ball I hit. Somebody in the Red Sox bullpen picked up the ball and tossed it to Dave Morehead in our bullpen.”8 John Curtis would have wished to have not the ball, but that pitch, back. Curtis did not pitch again in Boston in 1970. He was sent back to Pawtucket and started the 1971 season in Louisville. When he did finally wear a Boston uniform again, in September 1971, manager Eddie Kasko decided to use him as a starter. Curtis lost the first two games and then, coming out of the bullpen, recorded his first major-league win against the Cleveland Indians. His final appearance on the mound in 1971 was a complete game victory over the Washington Senators. Five game appearances, two wins, and two losses was his final tally for the year. Although he began the 1972 season with the Triple-A Louisville Colonels, he returned to Boston in May. He got more game opportunities and proved worthy of them, posting a 3.73 ERA to go with an 11-8 record. At the end of the 1972 season, Curtis became the answer to a trivia question. The new designated hitter rule would go into effect in 1973, and on September 28, 1972, Curtis became the last pitcher to ever bat in a regular lineup at Fenway Park, in the bottom of the seventh inning, in a 3-1 Red Sox win over the Kansas City Royals. Though Curtis was 13-13 with an ERA of 3.58, manager Kasko’s 1973 season did not turn out as well as he and others hoped. He was fired, much to the dismay of many of the players who praised him for the opportunities he gave them. John Curtis was vocal about his opinion of Kasko’s end. He told Peter Gammons. “I feel really badly about Eddie. He’s a man who gave me 50 starts in the big leagues right off. He’s a man who’d stick with me. We are the ones who let him down. I can’t look at this season and say we gave it our best shot. I thought we could win it, and as a team I think we have to look back and say we didn’t do what we should have. But as it has happened, I’d have to say I’m not unhappy at who is coming up. As you know, I have great respect for Darrell [Johnson. He got me here. He turned my entire career around and got me to be able to answer things for myself.”11 Reporters were finding Curtis a useful resource as an interview. 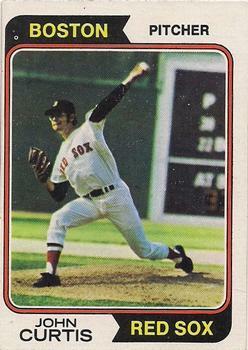 Eddie Kasko was not the only person exiting Boston at the end of the 1973 season. Curtis, along with Mike Garman and Lynn McGlothen, was traded to the St. Louis Cardinals for Reggie Cleveland, Terry Hughes, and Diego Segui. Curtis was with the Cardinals from 1974 to the end of the 1976 season, appearing mostly as a starter. In 1977, he was traded to the San Francisco Giants and was utilized much more as a reliever. During his three years with the Giants, he started 27 games and came out of the pen in 89. Curtis continued the West Coast years of his baseball career by signing with the San Diego Padres as a free agent. By the end of the1980 season, he found himself the ace of the staff, with a 10-8 record and a 3.51 average. Although he began the strike-shortened 1981 season as a starter, he ended up in the now familiar role as a reliever during the last half of the season. His contract was purchased by the California Angels in August 1982, and he remained with the team until he retired after the 1984 season. Upon retiring, Curtis considered what he might do next. He had always been an intelligent, insightful interview, sought out by reporters looking for an approachable player who provided useful material for their columns. It was a natural fit for him. He began writing articles for the San Diego Union-Tribune, Boston Globe, San Francisco Chronicle, and Sports Illustrated. He wrote articles for the San Francisco Examiner during the offseason, 1977 to 1979, and was given the freedom to write about whatever he wanted. He later reviewed books on baseball and other sports for the San Diego Union-Tribune. He also wrote a biography of sportswriter Ed Linn for the Dictionary of Literary Biography in 2005. As of 2018, John Curtis and his wife Mary Ann reside in Charleston, West Virginia. He continues to write and maintains an interest in baseball, in particular regarding young players advancing through the minors, as he had, to the major-league level. This biography was reviewed by Bill Nowlin and Rory Costello and verified for accuracy by the BioProject fact-checking team. 1 Correspondence with John Curtis, July 19, 2010. 2 James S. Hirsch, Willie Mays: The Life, the Legend (New York: Scribner, 2010), 258. 3 Correspondence with John Curtis, September 10, 2010. 4 Bruce Markusen, “The Hardball Times,” March 24, 2014. 6 Clif Keane, “K.C. Rips Sox, 11-3,” Boston Globe, August 14, 1970: 21. 7 Neil Singelais, “Yesterday: A Hit Tune Sox Would Like to Forget,” Boston Globe, August 14, 1970: 22. 9 “Curtis Writes: Sox Locker Room Silence Proved Big Point,” Boston Globe, October 8, 1972: 76. 11 Peter Gammons, “Sox Players Sorry Kasko Gone,” Boston Globe, October 1, 1973: 23. 12 Correspondence with John Curtis, July 19, 2010. 14 Correspondence with John Curtis, September 10, 2010.